Council Directive 74/347/EEC of 25 June 1974 on the approximation of the laws of the Member States relating to the field of vision and windscreen wipers for wheeled agricultural or forestry tractors (3) has been substantially amended several times (4). In the interests of clarity and rationality the said Directive should be codified. Directive 74/347/EEC is one of the separate Directives of the EC type-approval system provided for in Council Directive 74/150/EEC as replaced by Directive 2003/37/EC of the European Parliament and of the Council of 26 May 2003 on type-approval of agricultural or forestry tractors, their trailers and interchangeable towed machinery, together with their systems, components and separate technical units (5), and lays down technical prescriptions concerning the design and construction of wheeled agricultural or forestry tractors as regards the field of vision and windscreen wipers. These technical prescriptions concern the approximation of the laws of the Member States to enable the EC type-approval procedure, provided for in Directive 2003/37/EC, to be applied in respect of each type of tractor. Consequently, the provisions laid down in Directive 2003/37/EC relating to agricultural or forestry tractors, their trailers and interchangeable towed machinery, together with their systems, components and separate technical units, apply to this Directive. 1. ‘Agricultural or forestry tractor’ means any motor vehicle, fitted with wheels or endless tracks and having at least two axles, the main function of which lies in its tractive power and which is specially designed to tow, push, carry or power certain tools, machinery or trailers intended for agricultural or forestry use. It may be equipped to carry a load and passengers. No Member State may refuse to grant EC type-approval or national type-approval of a tractor on grounds relating to windscreen wipers if these satisfy the requirements set out in Annex I. No Member State may refuse the registration or prohibit the sale, entry into service or use of tractors on grounds relating to windscreen wipers, if these satisfy the requirements set out in Annex I. The amendments necessary to adapt the requirements of Annex I to technical progress shall be adopted in accordance with the procedure referred to in Article 20(2) of Directive 2003/37/EC. Directive 74/347/EEC, as amended by the Directives listed in Annex II, Part A, is hereby repealed, without prejudice to the obligations of the Member States relating to the time-limits for transposition into national law and application of the Directives as set out in Annex II, Part B. It shall apply from 1 May 2008. (1) OJ C 161, 13.7.2007, p. 35. (3) OJ L 191, 15.7.1974, p. 5. Directive as last amended by Directive 97/54/EC of the European Parliament and of the Council (OJ L 277, 10.10.1997, p. 24). (5) OJ L 171, 9.7.2003, p. 1. Directive as last amended by Council Directive 2006/96/EC (OJ L 363, 20.12.2006, p. 81). ‘Field of vision’ means all forward and lateral directions in which the driver of the tractor can see. ‘Reference point’ means the position, fixed by convention, of the tractor driver's eyes notionally located at a single point. The reference point is situated in the plane parallel to the longitudinal median plane of the tractor and passing through the centre of the seat, 700 mm vertically above the line of intersection of that plane and the surface of the seat and 270 mm in the direction of the pelvic support from the vertical plane passing through the front edge of the surface of the seat and perpendicular to the longitudinal median plane of the tractor (Figure 1). The reference point thus determined relates to the seat when unoccupied and fitted in the central position specified by the tractor manufacturer. ‘Semi-circle of vision’ means the semi-circle described by a radius of 12 m about a point situated in the horizontal plane of the road vertically below the reference point, in such a way that, when facing the direction of motion, the arc of the semi-circle lies in front of the tractor, while the diameter bounding the semi-circle is at right angles to the longitudinal axis of the tractor (Figure 2). ‘Masking effect’ means the chords of the sectors of the semi-circle of vision which cannot be seen owing to structural components such as roof-pillars, air intakes or exhaust stacks and the frame of the windscreen. by the zone lying outside the semi-circle of vision, and forming the continuation of the sector of the semi-circle of vision, the chord of which is 9,5 m long, perpendicular to the plane parallel to the longitudinal median plane of the tractor passing through the centre of the driver's seat and bisected by that plane. ‘Swept area of the windscreen wipers’ means the area of the outer surface of the windscreen swept by the windscreen wipers. The tractor shall be constructed and equipped in such a way that, in road traffic and in farm and forest use, the driver has an adequate field of vision, under all the usual conditions pertaining to highway use and to work undertaken in fields and forests. The field of vision is considered adequate when the driver has, as far as possible, a view of part of each front wheel and when the following requirements are fulfilled. 2.2.1.1. The tractor must be placed on a horizontal surface as shown in Figure 2. On a horizontal support level with the reference point, there must be mounted two point sources of light, e.g. 2 × 150 W, 12 V, 65 mm apart and symmetrically located with respect to the reference point. 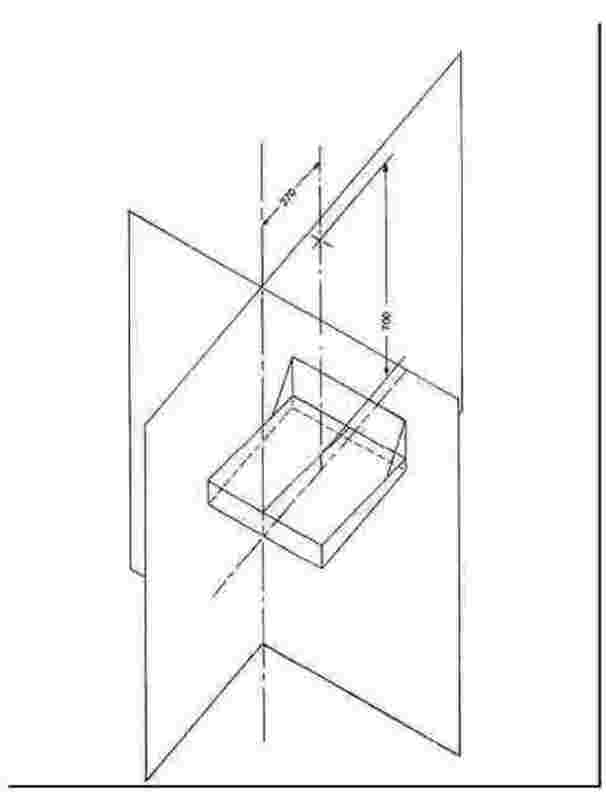 The support must be rotatable at its centre point about a vertical axis passing through the reference point. For the purpose of measuring the masking effects, the support must be so aligned that the line joining the two light sources is perpendicular to the line joining the masking component and the reference point. 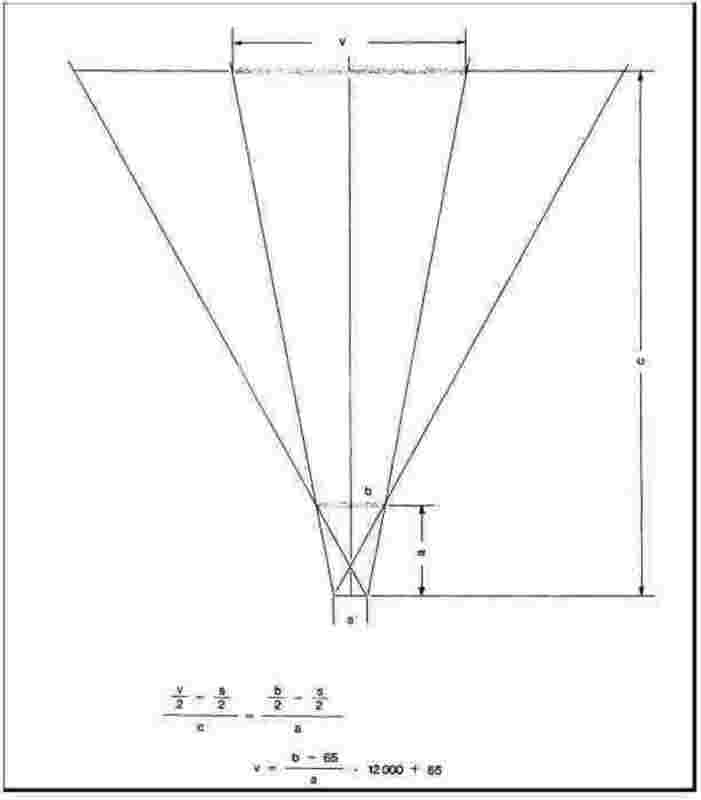 The silhouette (deepest shadow) overlaps projected on to the semi-circle of vision by the masking component when the light sources are switched on simultaneously or alternately must be measured in accordance with point 1.4 (Figure 3). 2.2.1.2. Masking effects must not exceed 700 mm. 2.2.1.3. Masking effects due to adjacent structural components over 80 mm in width must be so configured that there is an interval of not less than 2 200 mm — measured as a chord of the semi-circle of vision — between the centres of two masking effects. 2.2.1.4. There may be no more than six masking effects in the semi-circle of vision and no more than two inside the sector of vision defined in point 1.5. 2.2.1.5. Outside the sector of vision, masking effects exceeding 700 mm but not exceeding 1 500 mm are, however, permissible if the components causing them cannot be redesigned or relocated: on each side there may be a total of either two such masking effects, one not exceeding 700 mm and the other not exceeding 1 500 mm, or two such masking effects, neither exceeding 1 200 mm. 2.2.1.6. Blind spots caused by type-approved rear-view mirrors may be disregarded if the design of these mirrors is such that they cannot be installed in any other way. is the width in millimetres of the component obstructing vision measured horizontally and perpendicular to the visual radius. 2.3. The test methods referred to under point 2.2 may be replaced by others if the latter can be shown to be equivalent. 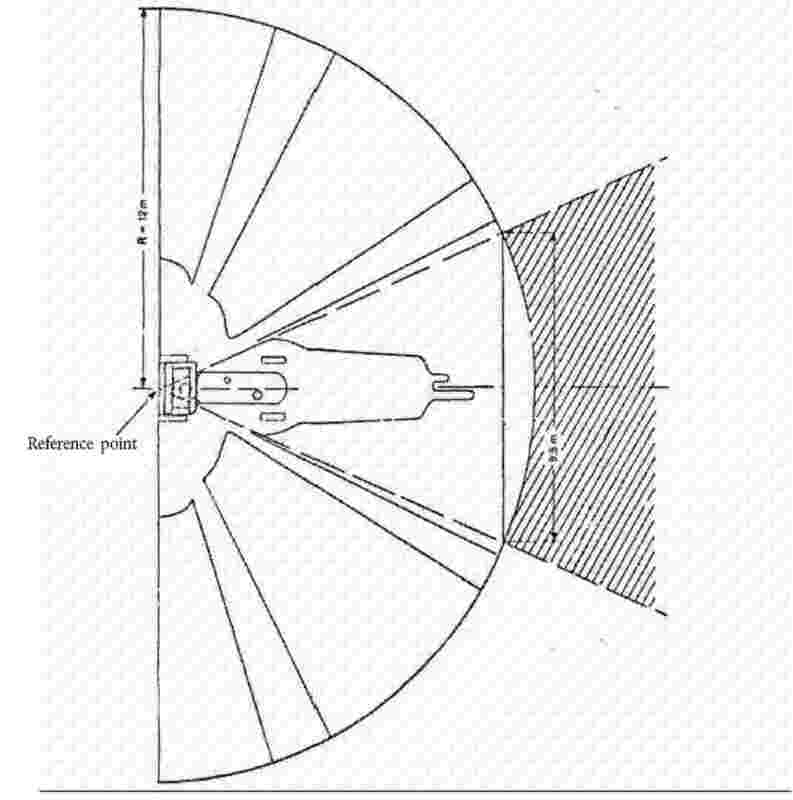 For the purpose of determining the masking effects in the sector of vision, the masking effects due to the frame of the windscreen and to any other obstacle may, in accordance with the provisions of point 2.2.1.4, be considered as a single effect, provided that the distance between the outermost points of this masking effect does not exceed 700 mm. 2.5.1. Tractors fitted with windscreens must also be equipped with motor-driven windscreen wipers. The area swept by these wipers must ensure an unobstructed forward view corresponding to a chord of the semi-circle of vision at least 8 m long within the sector of vision. 2.5.2. The rate of operation of the windscreen wipers must be at least 20 cycles per minute. if the field of vision of this type of tractor or of these tractors complies with the provisions of this Directive. may refuse to grant national type-approval in respect of a type of tractor whose field of vision does not comply with the provisions of this Directive.